Deng Xiaoping said "since we can't solve the South China Sea issue, we can leave it to the next generation which will be smarter." It is impossible to resolve the disputes over the South China Sea to the mutual benefit of all. Hypothetically, the claims of other littoral states could be reconciled by sectoral extensions of the Exclusive Economic Zones [as was done in the Gulf of Guinea]. China's claims cannot be so reconciled, since China claims vritually the entire South China Sea, which it views as internal waters. 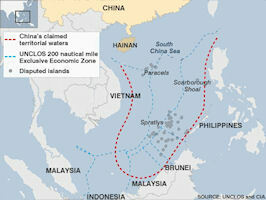 China claims most of the South China Sea as either territorial water or Exclusive Economic Zone. China's claims cannot be reconciled with the claims of other states in the South China Sea area. The other states have conflicting claims that can be harmonized, the way there were compromises among the conflicting claims for the Gulf of Guinea in Africa. In the South China Sea, each of the littoral states claims areas that are immediately contiguous to their territorial seas, and it would be possible to "split the difference" on competing claims. But China claims the entirety of the South China Sea, so there is no possibility of compromise with China's position, since it is all or nothing. Travers Twiss wrote in 1856 "The Ocean or open Sea is by Nature not capable of being reduced into the possession of a Nation, since no permanent settlement can be formed upon its ever changing surface; neither is it capable of being brought under the Empire of a Nation, as no armed fleet can effectively occupy it in its full extent, so as to preclude other Nations altogether from the use of it. Nature herself has in these respects set limits to human enterprise and human ambition. But independently of these insurmountable difficulties, the use of the open Sea, which consists in navigation, is innocent and inexhaustible; he who navigates upon it does no harm to any one, and the Sea in this respect is sufficient for all mankind. But Nature does not give to man a right to appropriate to himself things which may be innocently used by all, and which are inexhaustible and sufficient for all. For since those things, whilst common to all, are sufficient to supply the wants of each, whoever should attempt to render himself sole proprietor of them, (to the exclusion of all other participants,) would unreasonably wrest the bounteous gifts of nature from the parties excluded." In July 1977, when Deng Xiaoping emerged as China's leader following the death of Mao Tse-tung, the Chinese foreign minister, Huang Hua, confirmed that China's claim to the South China Sea was "non-negotiable" in the strongest terms. At the same time he commented: "The territory of China reaches as far south as the James Shoals, near Malaysia's Borneo territory... I remember that while I was still a schoolboy, I read about those islands in the geography books. At that time, I never heard anyone say those islands were not China's... The Vietnamese claim that the islands belong to them. Let them talk that way. They have repeatedly asked us to negotiate with them on the issue; we have always declined to do so... As to the ownership of the islands, there are historical documents that can be verified. There is no need for negotiations since they originally belonged to China.... In this respect Taiwan's attitude is all right. At least they have some patriotism and would not sell out the islands..."
Under the United Nations Convention on the Law of the Sea (UNCLOS) coastal states have the right to establish sovereignty over adjacent waters out to a maximum of 12 nautical miles from the nation's coastline, including the coastline of offshore islands. These enclosed waters are known as the coastal state's territorial sea. During the negotiations of the text of the 1982 UNCLOS military activities in the EEZ were a controversial issue. Some coastal States such as Bangladesh, Brazil, Cape Verde, Malaysia, Pakistan and Uruguay contended that other States cannot carry out military exercises or maneuvers in or over their EEZ without their consent. In June 1998, the PRC passed the "Exclusive Economic Zone and Continental Shelf Act." This Act created an exclusive economic zone (EEZ) with 200 nautical mile limits from its coastal baseline, and claimed the right, inter alia, to broadly undefined powers to enforce laws in the EEZ, "including security laws and regulations." Based on the Act, the PRC does not recognize the airspace above its EEZ as "international airspace" and has interfered with and protested US reconnaissance flights over its EEZ. China takes the position that all maritime data collection activities, including military intelligence and hydrographic collection activities, fall within the United Nations Convention on the Law of the Sea [UNCLOS] provisions for marine scientific research and therefore require coastal-state consent before they could be carried out in the two-hundred-nautical-mile EEZ. The US has protested this sovereignty claim as a violation of international law numerous times since this law was passed. The US Government has long conducted a vigorous freedom of navigation program through which it has asserted its navigational rights in the face of what it has regarded as excessive claims by coastal states of jurisdiction over ocean space or international passages. When remonstrations and protestations are unavailing, elements of US military forces may sail into or fly over disputed regions for the purpose of demonstrating their right and determination to continue to do so. ASEAN countries are outward-looking, especially in term of protecting their Exclusive Economic Zones (EEZ). The convergence of interests in conflict areas such as the Spratly Islands affects the relationship among Malaysia, Philippines and Brunei with each claiming parts of the Spratlys. While armed conflicts among the countries of ASEAN overthe Spratly issue may be a remote possibility, it hascompounded historic frictions over unresolved territorial conflicts. This will continue to be one of the driving force behind arms acquisition which is clearly demonstrated by the expansion of the naval and air forces of Malaysia. All the other ASEAN countries - except for Brunei - have expanded their naval and air arms to safeguard their maritime interests. Most of the marine traffic in the South China Sea goes to the People's Republic of China and Hong Kong. Vietnam, Indonesia, Taiwan, and the Philippines are largely served by coast-hugging routes outside the PRC’s dreaded Nine-Dash-Line. Euan Graham, in Japan’s Sea Lane Security: A Matter of Life and Death?, published in 2005, wrote "The cost to Japan of a 12-month closure of the South China Sea, diverting oil tankers via the Lombok Strait and east of the Philippines, has been estimated at $200 million. A Japanese estimate puts the cost as basically the same to that imposed by a closure of the Malacca Strait, requiring 15 additional tankers to be added to the route, generating an extra $88 million in shipping costs. This is roughly corroborated by the reported findings of a joint study conducted by the JDA and the Indonesian authorities in the late 1980s, which put the number of extra tankers required to divert around the South China Sea via Lombok and east of the Philippines at 18.... The volume of oil shipped to Japan from the Middle East is evenly split between Lombok and the Straits of Malacca …"